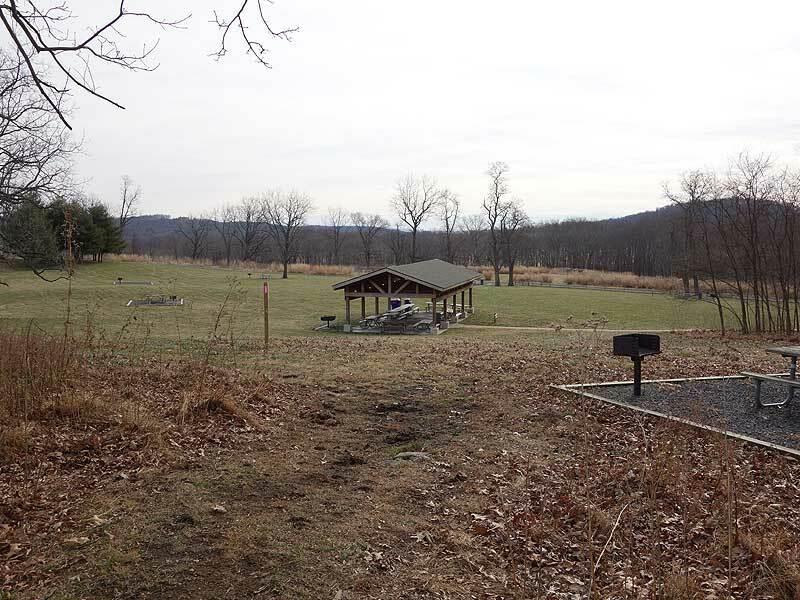 With a large picnic area and many interconnecting trails, including the newer James Ball, Corporal Morgan, and Hadows trails, Sky Meadows Park has become a popular destination for families and more experienced hikers alike. 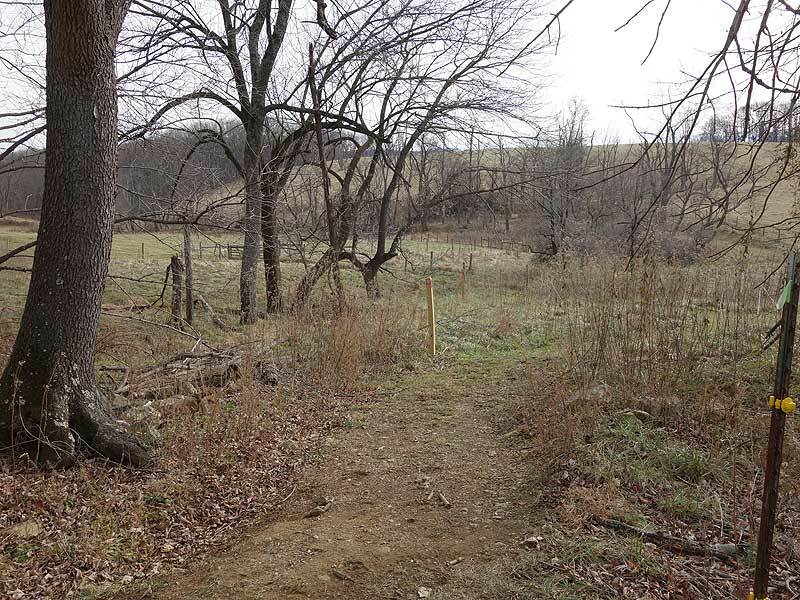 The lower trials pass through rolling fields and cross babbling brooks, with the upper trails above Bleak House providing spectacular views of the Piedmont. 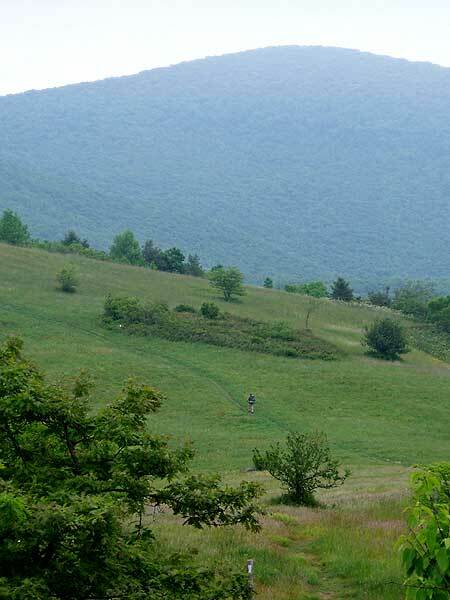 The 7.1 mile circuit hike we describe here takes you through the lower trails and pastures along several creeks, then heads uphill on the South Ridge to the North Ridge Trail and Appalachian Trail (AT). 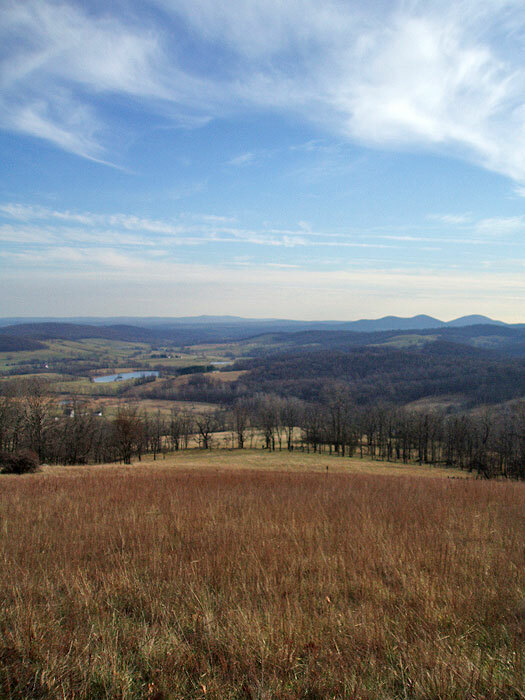 The meadows in this section of the circuit are similar to the high meadows found on Cold Mountain in the southwestern part of Virginia. Finally descend back towards the parking area and pass the Piedmont Overlook, the best vista of the circuit. Also make sure to check out the many events the park has to offer. 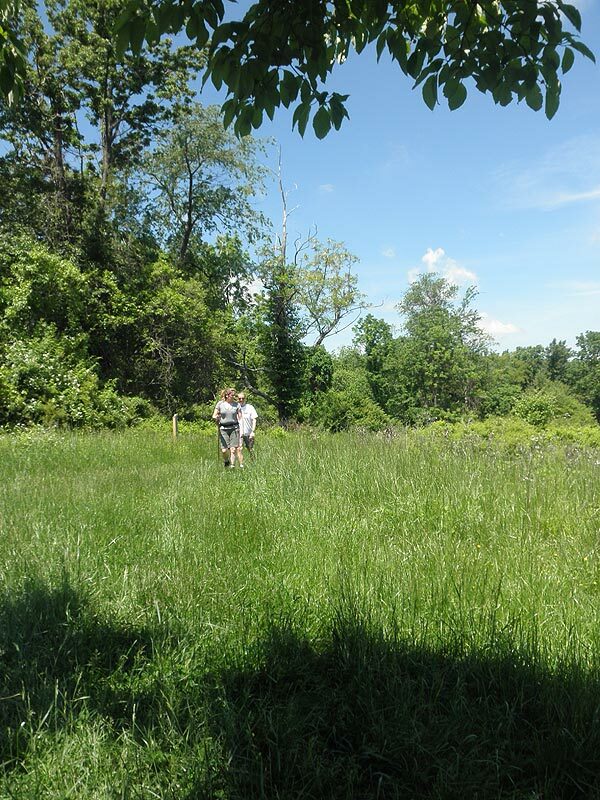 From astronomy, to hikes and camp outs, Sky Meadows has something for everyone! Mile 0.0 - From the parking area pass the information kiosk on the paved path towards the Park Office. 50ft before the Park Office turn right onto the green blazed continuation of the Boston Mill Road. 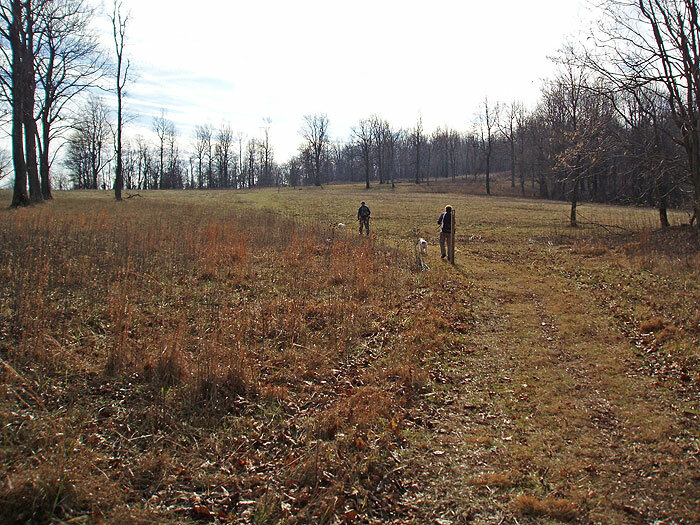 Follow the trail next to a large field where the trail turns right then terminates where the pink blazed James Ball Trail begins. 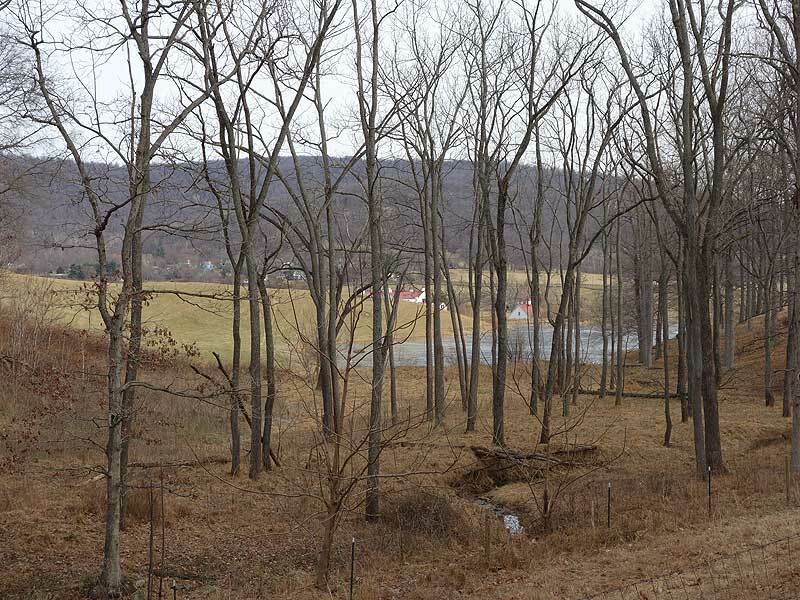 Mile 0.25 - Continue on the James Ball Trails passing a view of one of the valley ponds near Paris, then climb a small rise through the trees and emerge in another field. 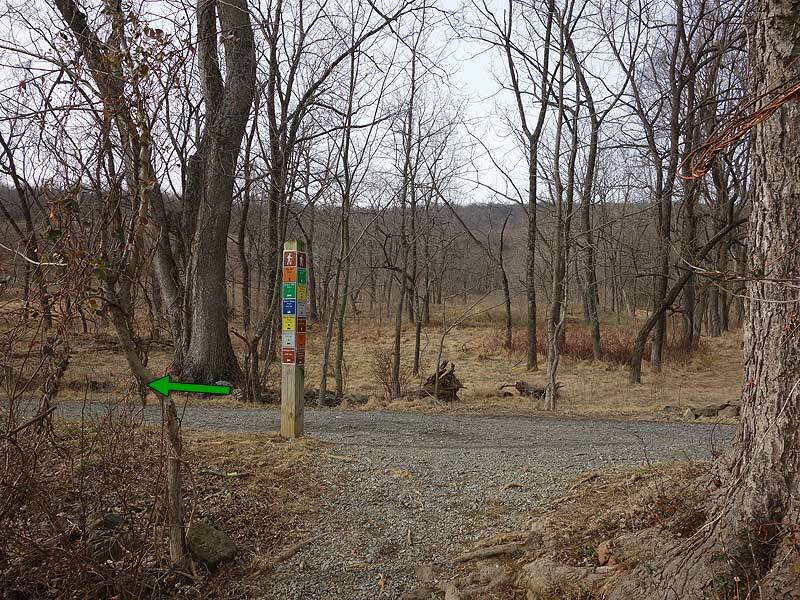 The trail will now descend before passing through the main picnic area at Sky Meadows Park. 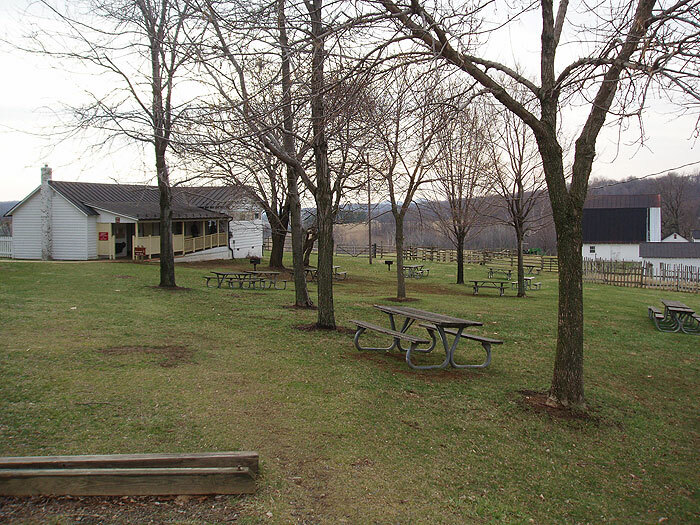 The picnic area has many picnic tables and charcoal barbecues that are available on a first come first served basis. The shelter barbecue area needs to be reserved. 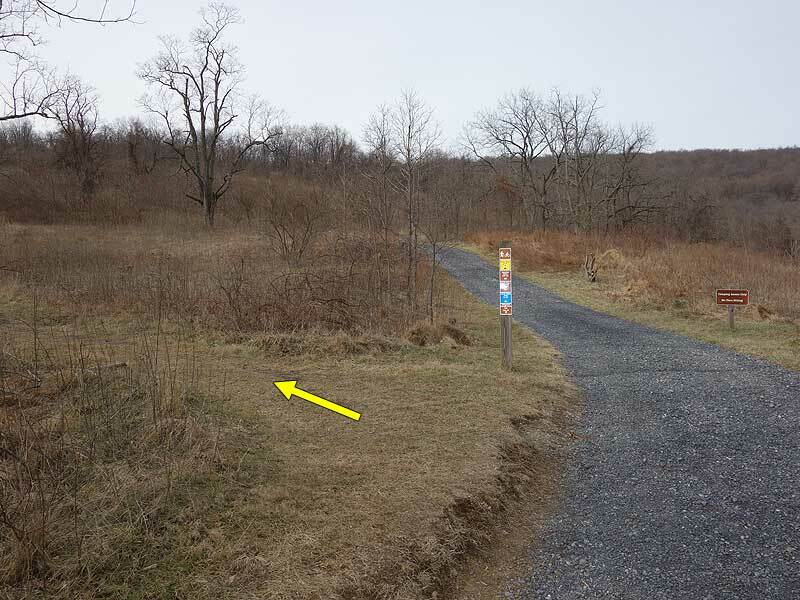 Stay to the left of the picnic area passing a pine tree stand where the James Ball trail continues on the opposite side of the service road. Continue on the pink blazed James ball Trail for another 0.1 miles where the trail terminates with the brown blazed Corporal Morgan Trail. 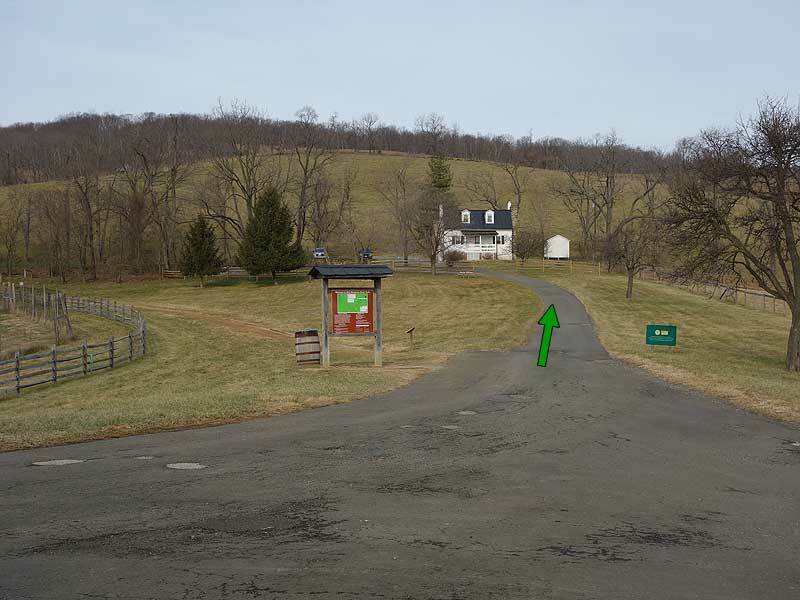 Mile 1.15 - Turn right on the brown blazed Corporal Morgan Trail as it winds around the east end of the large picnic area. 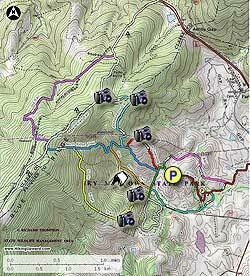 Shortly arrive at a Trail Marker and stay left on the brown blazed trail. 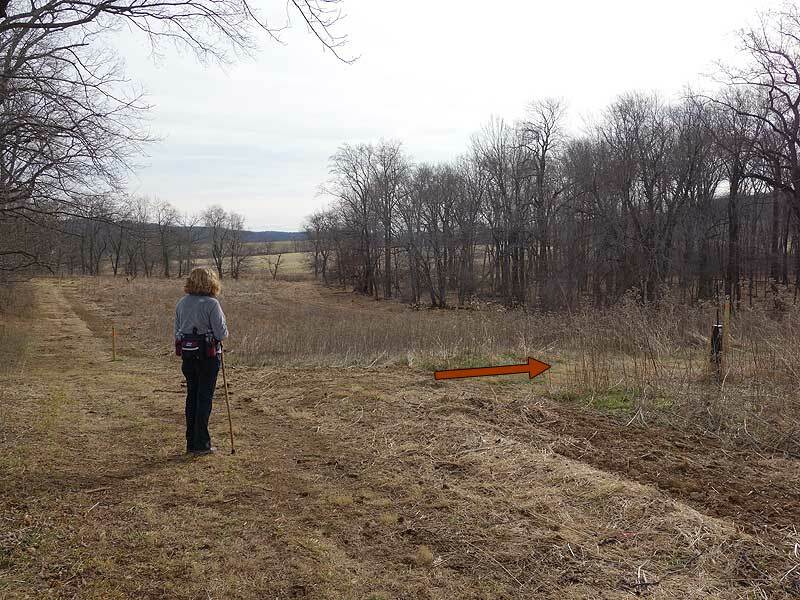 Cross a small creek then the brown blazed Corporal Morgan Trail turns right, and the tiel blazed Hadow Trail turns left. Mile 2.4 - Turn left uphill on the yellow blazed South Ridge Trail passing an overlook. 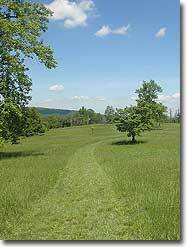 In 0.1 miles pass homestead ruins where the trail becomes steeper before arriving at a clearing and another overlook. 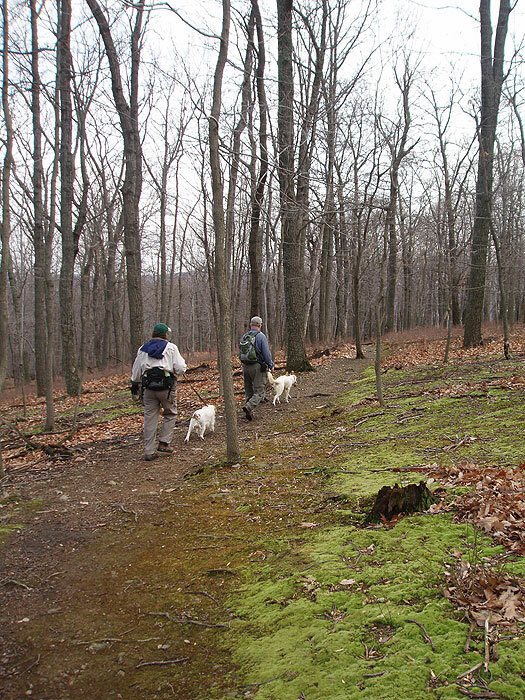 Continue uphill into a more heavily wooded area on the South Ridge Trail, then in 1.0 miles reach the intersection of the North Ridge trail. 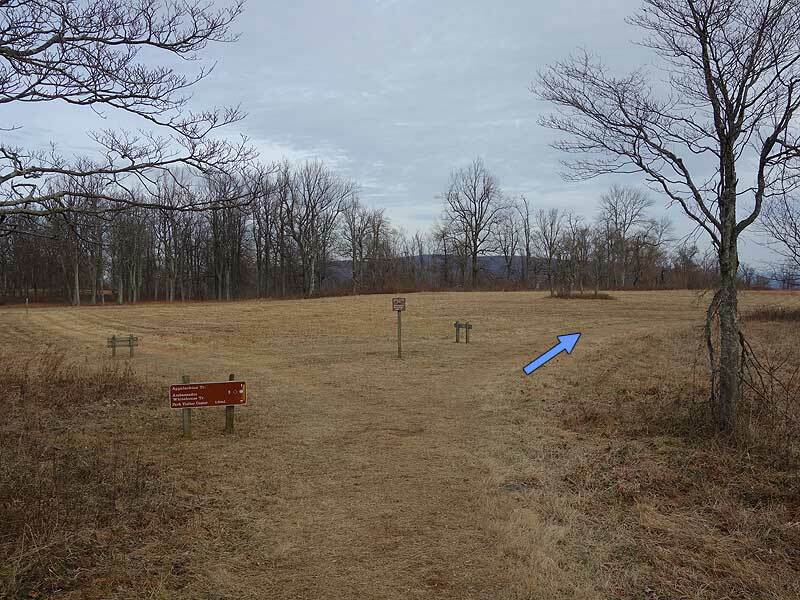 Mile 4.0 - Turn left uphill on the blue blazed North Ridge Trail for 0.3 miles to the ridge and intersection of the white blazed Appalachian Trail (AT). 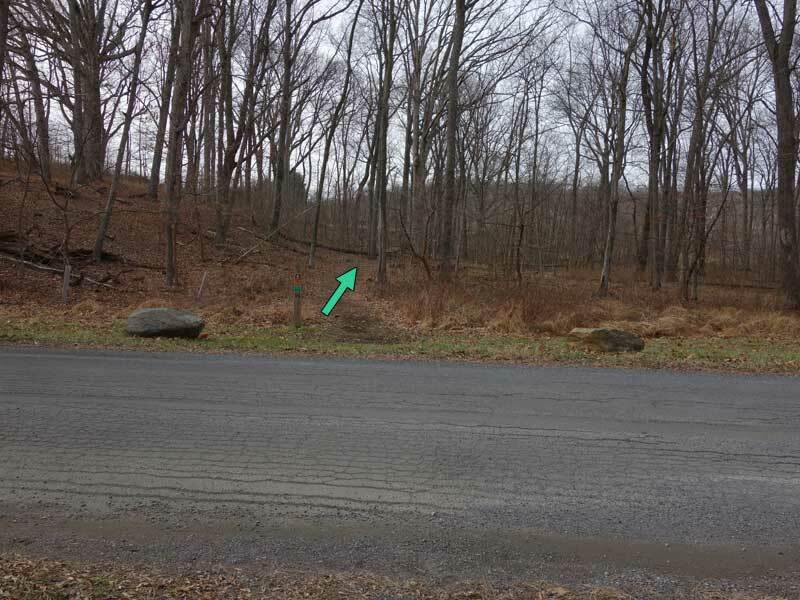 Mile 4.3 - Turn right north on the AT and and pass the intersection of the purple blazed Old Trail. 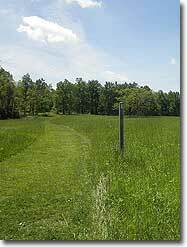 Stay straight on the AT, cross a pipeline clear cut then pass through a livestock gate. 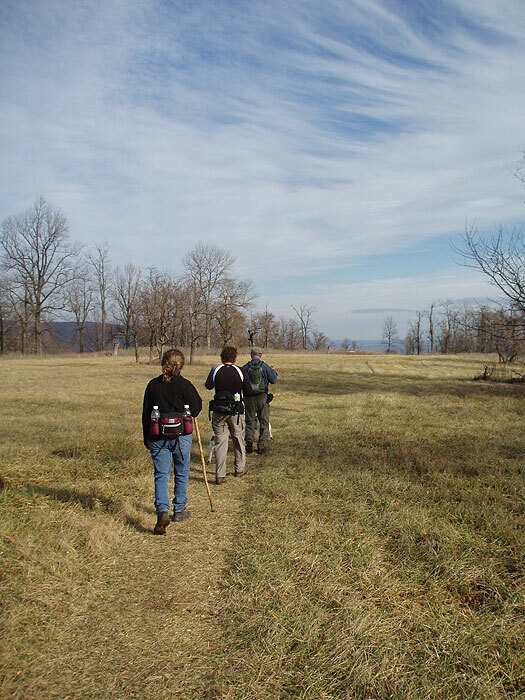 The AT will now gently descend to the intersection of the Ambassador Whitehouse Trail and arrive at the mountain meadows. 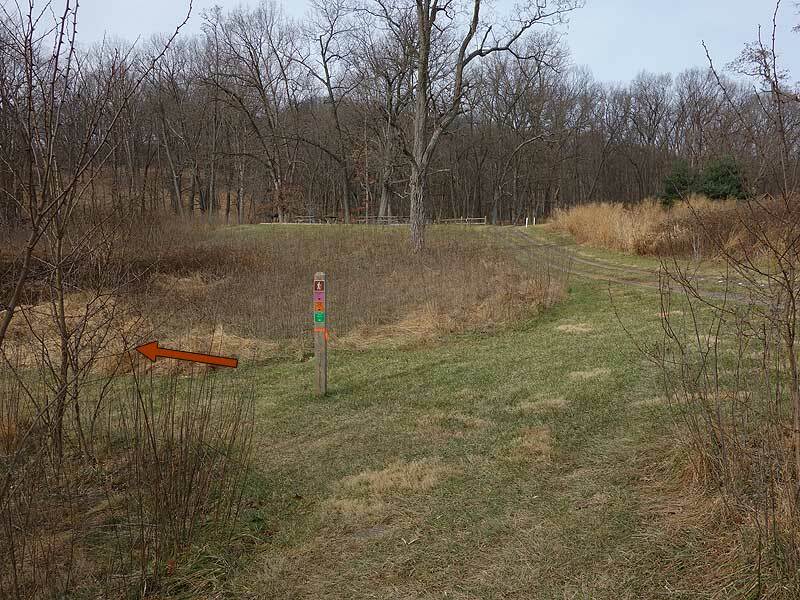 Mile 5.1 - Stay right on to the Ambassador Whitehouse Trail as it descends through the meadows, then renters the forest in 0.8 miles. Pass through a wooded area, cross the pipeline clear cut where the trail turns right, then descend steeply for 0.1 miles to the intersection of the North Ridge Trail. 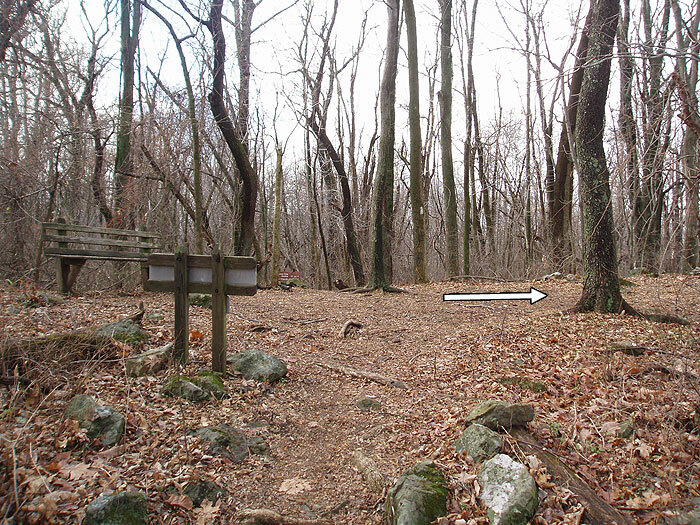 Mile 6.2 - Turn left on the North Ridge Trail for 75 yards to the intersection of the Piedmont Overlook Trail. 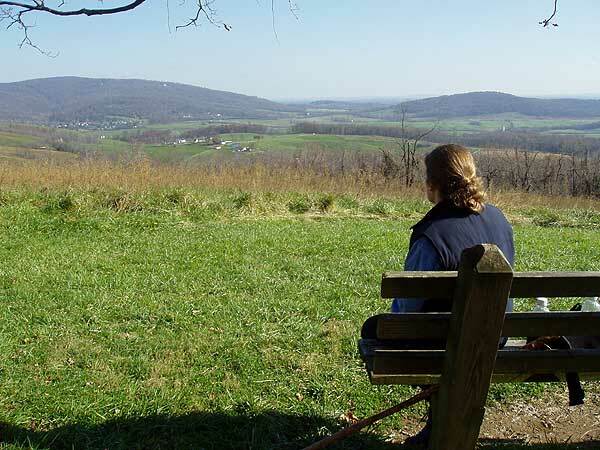 Turn left on the Piedmont Overlook Trail for 0.1 miles yards then cross a fence stile into an open field with a panoramic view of the Piedmont Valley. 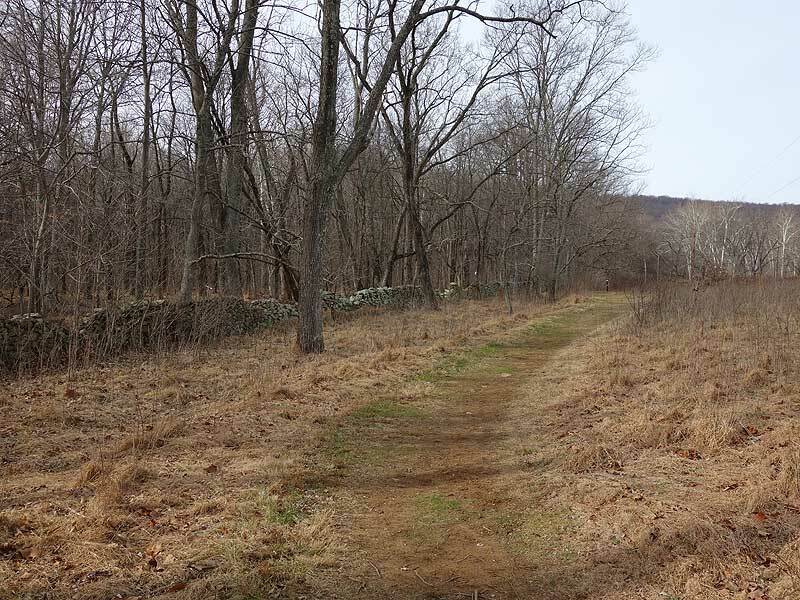 Continue down the trail for the remaining 0.8 miles back to Boston Mill Road, then turn left following the short distance back to Mount Bleak House and the parking area. Mile 7.1 - Arrive back a the parking area. 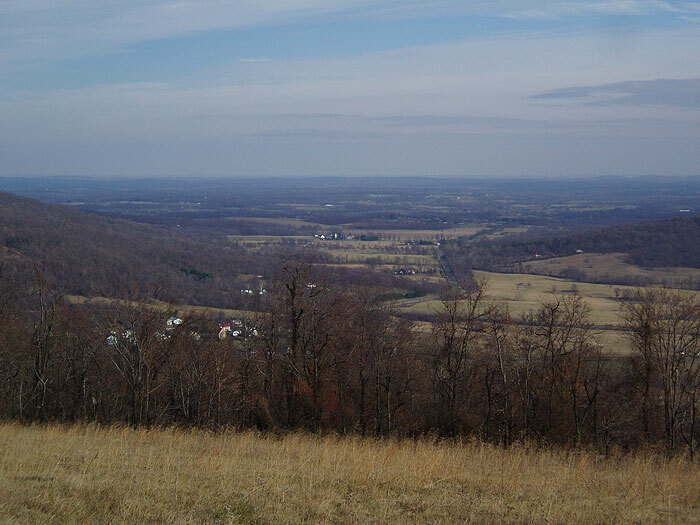 In 1731, James Ball purchased from Lord Fairfax a 7,883-acre tract on the east side of the Blue Ridge, south of Ashby’s Gap. Ball died in 1754, and his land was divided among his daughter and five grandsons. 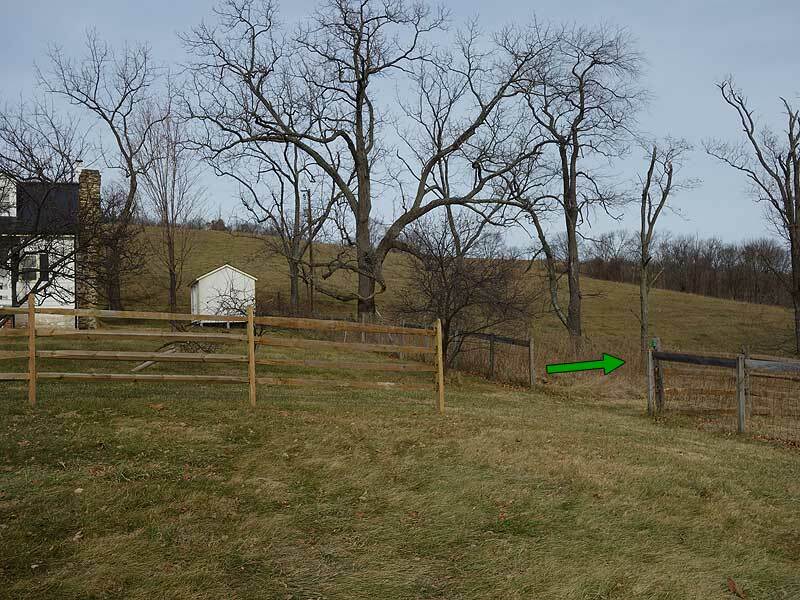 John Edmonds purchased James Ball’s land from one of Ball’s grandsons in 1780. Edmonds then built a 1 1/2. story house, which still stands. He died in 1798, and his land was divided among his five children. Sons Elias and George sold most of their inherited land to Isaac Settle, respected postmaster and tavern-keeper in the nearby village of Paris. 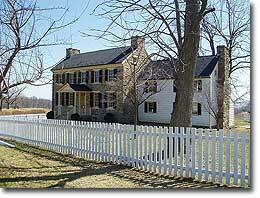 In 1812, Isaac Settle built a large brick house and named it “Belle Grove” (located just south of the park) where he and his wife Mary raised three children. 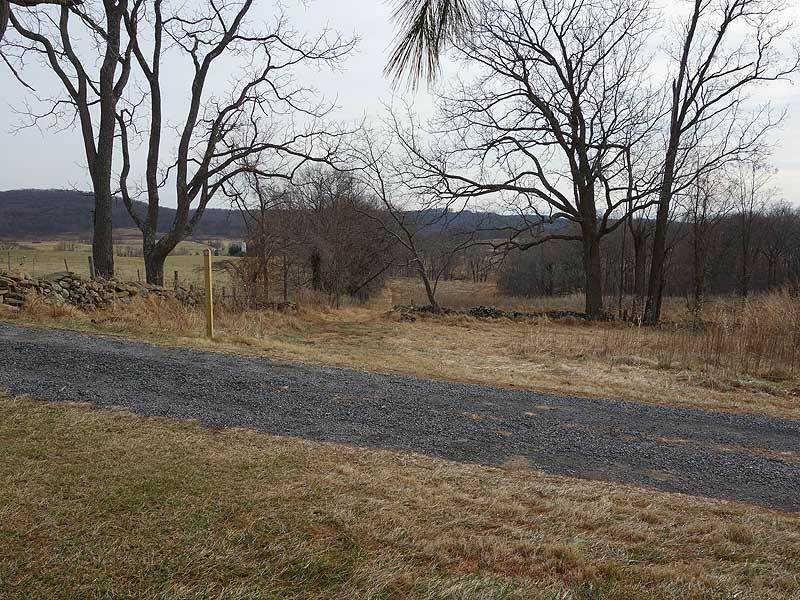 In 1842, he sold the Belle Grove farm to his son-in-law Lewis Edmonds, who, a year later, sold 148 acres to Isaac’s son Abner Settle. 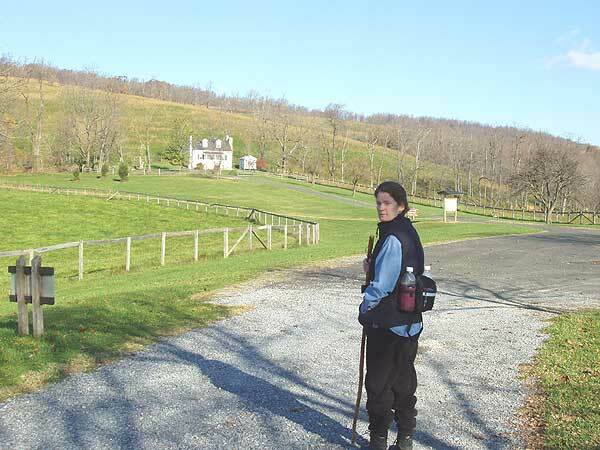 On his new farm, Abner built the stone portion of what is now the "Mount Bleak” house. By 1850, he had added the frame portion of the house to accommodate himself, wife Mary, their six children, and his father. By 1862, five more children were born to the Settles. 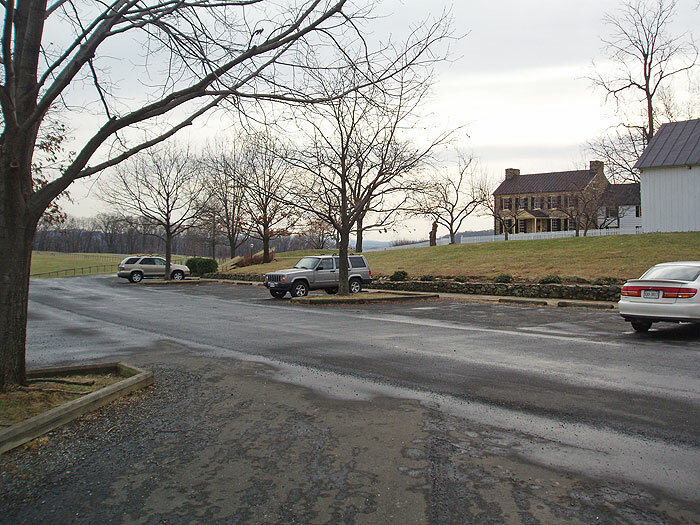 In 1866, because of declining health, Abner Settle sold the Mount Bleak farm to Thomas Glascock. Glascock sold the property in 1868 to George M. Slater, who had been a member of Mosby’s Rangers during the Civil War. Slater and his son owned the farm until they both died in 1923. 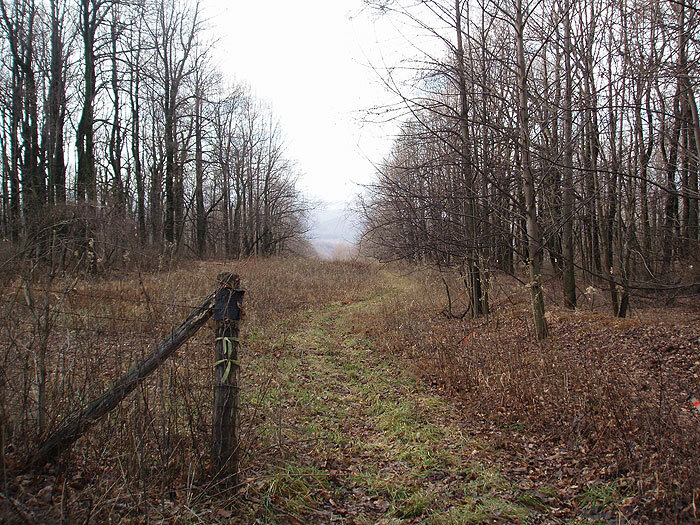 During the following decades, the land changed hands several times. 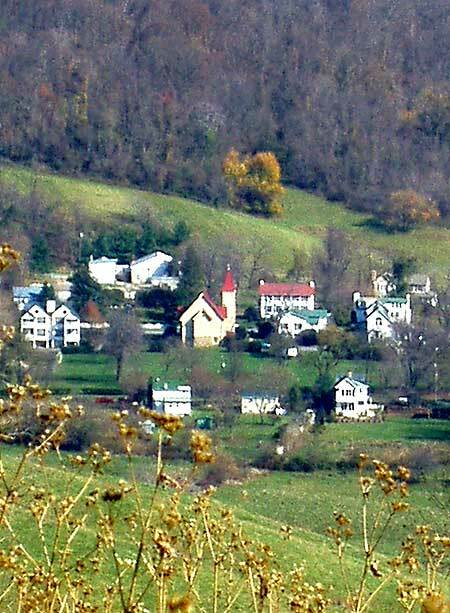 In 1966 a housing development was planned and the property was divided into 50-acre lots. This scenic area was saved through the actions of Paul Mellon. 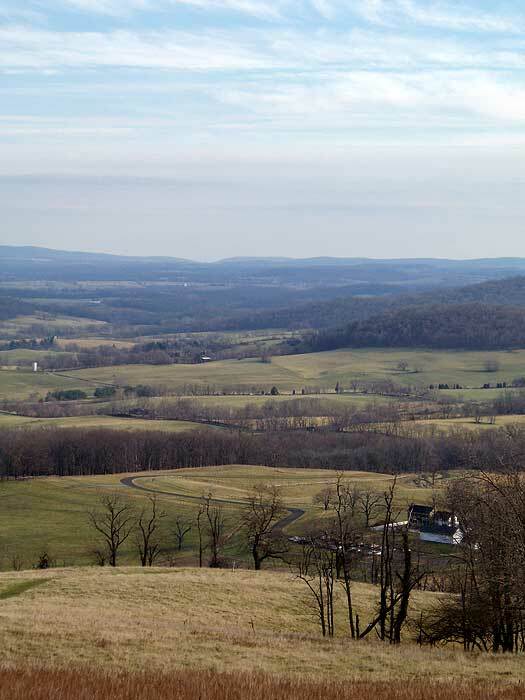 Virginia State Parks received the 1,132-acre farm as a gift from Mr. Mellon in 1975. 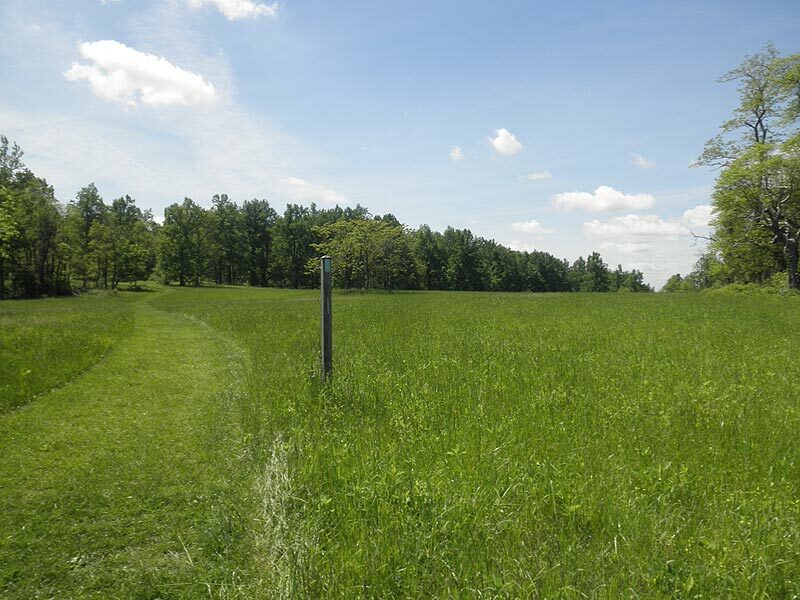 After building facilities to accommodate the public, the Commonwealth opened Sky Meadows State Park in 1983. 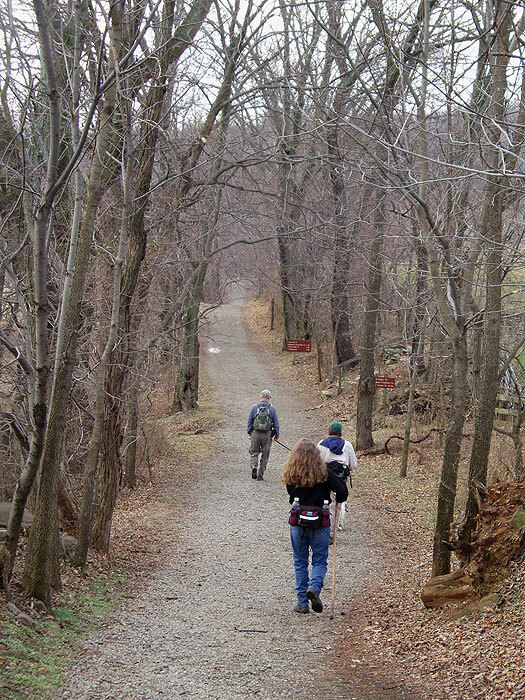 A 248-acre corridor between the park and U.S. Route 50 containing three miles of the Appalachian Trail was added in 1987. 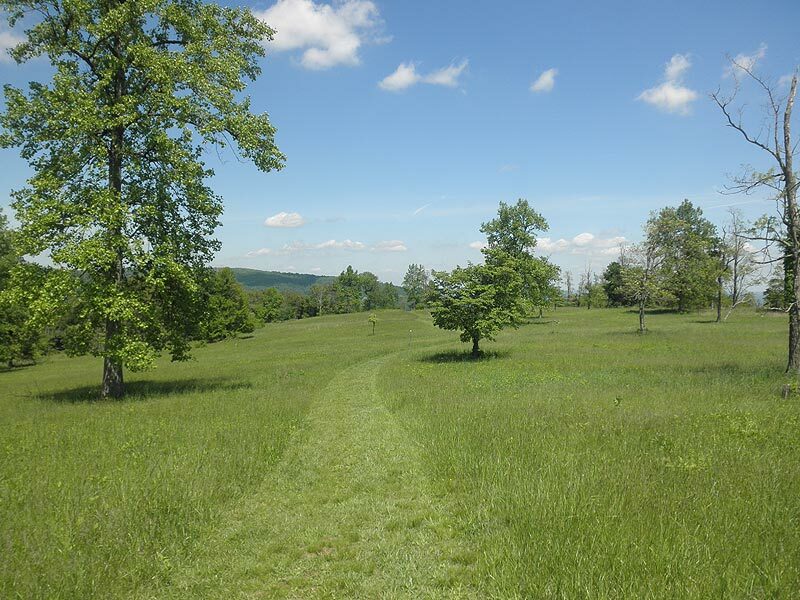 In 1991, Paul Mellon presented an additional 462-acre tract of land as a gift to the park. 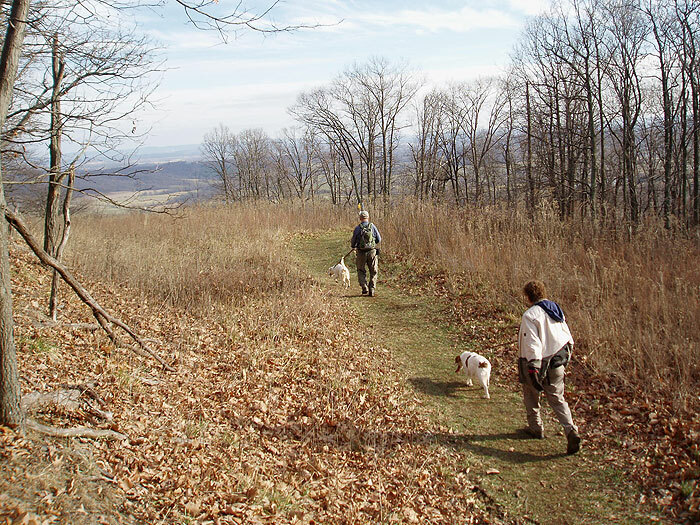 The Virginia Outdoor Foundation was active in the acquisition process. 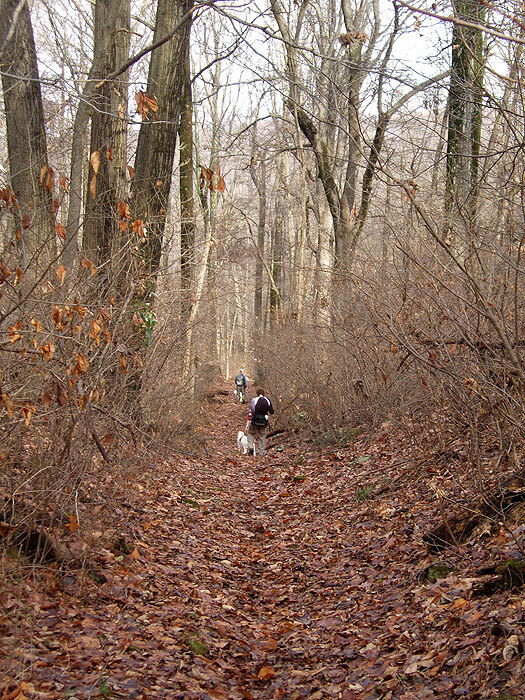 The tract, the Lost Mountain Bridle Trail area, contains a parcel of land that was purchased from Lord Fairfax by George Washington. 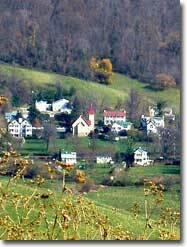 During the 19th and 20th centuries, the land had been farmed by several local families. We modified / shortened the hike which was easy because the trails are so well marked. We started at the Visitor Center then Piedmont Overlook > Ambassador Whitehouse > AT > Northridge > Gap Run > Boston Mill Rd > Visitor Center. About 5 miles. Great views, extremely well marked, but we saw a lot of people. 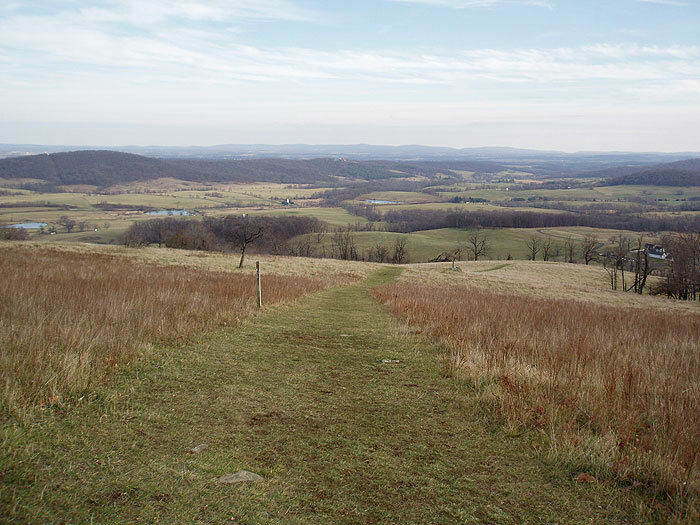 Did this hike on New Year's Day as part of the Virginia State Parks 1st Day Hike New Year Challenge where you could access the Virginia State Parks for free. Even if you had to pay the parking fee, it is only $5.00. Now to the review of the hike. Ok, this is only a partial review of the hike as we did not hike the entire hike as described. 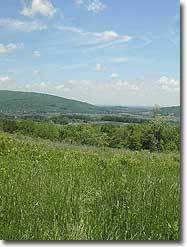 Due to us arriving at Sky Meadows around noon, the temperatures being in the 20's, light snow on the ground, and the shorter winter days, we decided to do a slight modification to the hike. Instead of turning right on the blue blazed Boston Mill Road, we turned left. 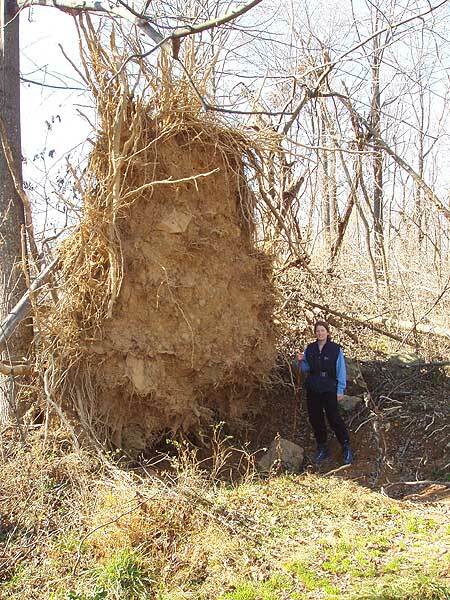 Therefore, we did not hike on the James Ball Trail, Corporal Morgan Trail, and Hadow Trail. This cut about 2.25 miles out of the hike making it about 4.85 miles long. Even eliminating these trails, there was plenty of scenery and it made for a good day hike. On the South Ridge Trail after you pass the homestead ruins, there is a side trail (about 0.4 miles on the South Ridge Trail) which leads to an overlook. 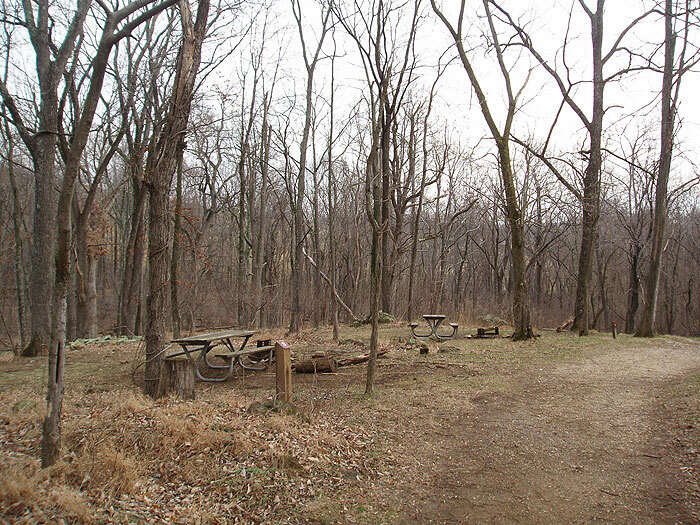 This trail is located at the bench after you pass the homestead ruins. 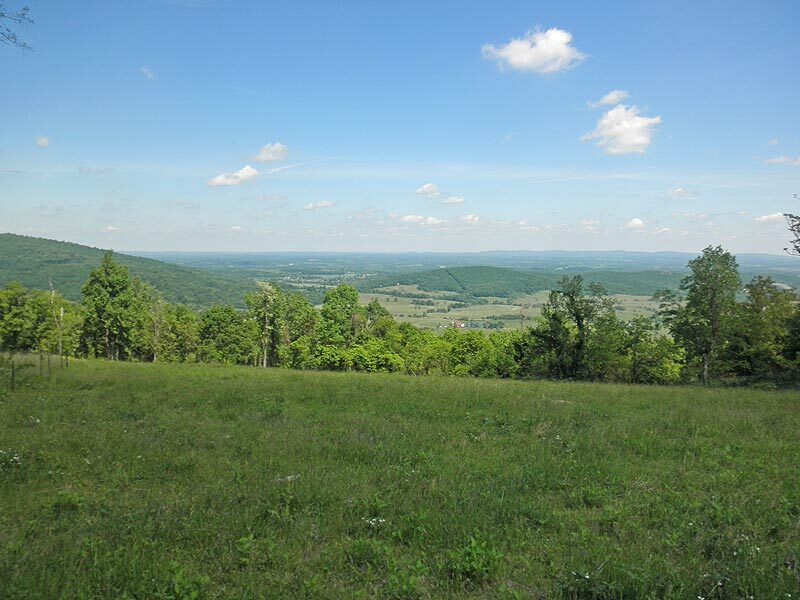 Taking this side trail to the overlook is a very short detour from the described hike and well worth it as you have a good view to the south/south west. 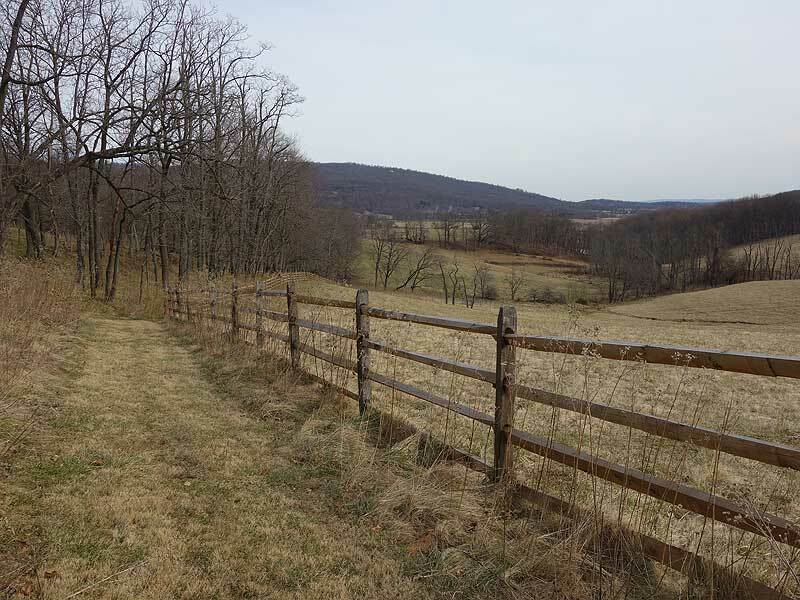 The overlook has a plaque honoring a park volunteer and a small area deliniated with a short split rail fence. There is no bench here however, there are some large rocks you could sit on in the small fenced area. 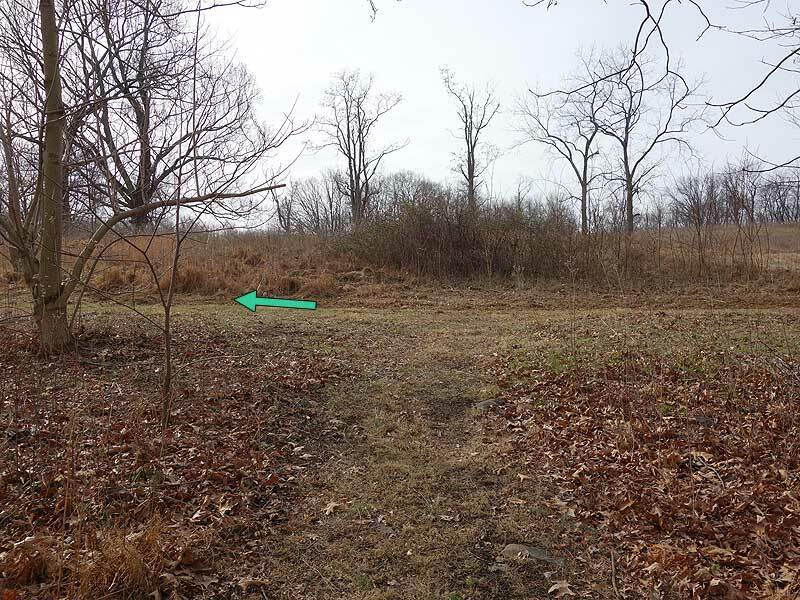 This little side trail is not noted on any map (the one for the hike here or the state park trail map) however, it is easy to follow and very well marked. 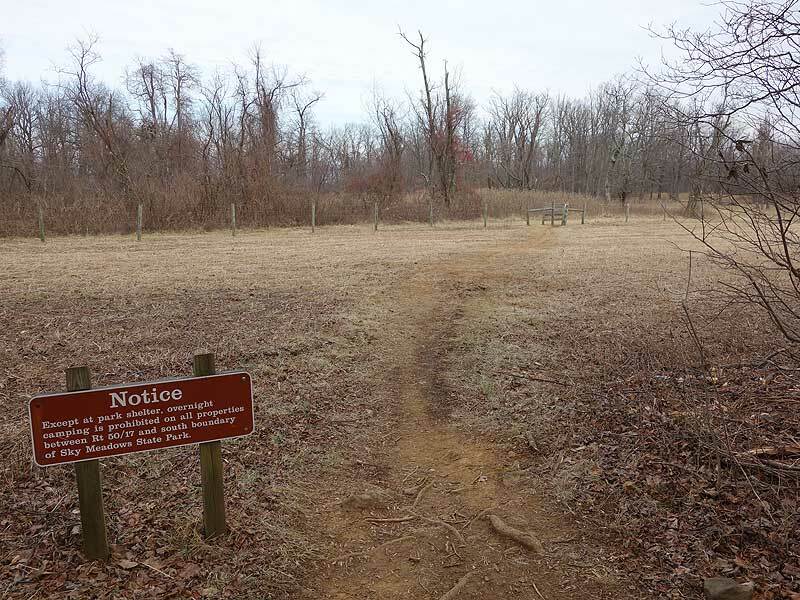 At this side trail to the overlook, you are 1.1 miles from the North Ridge Trail according to the park trail signage. Not really any any views along the North Ridge Trail or AT. 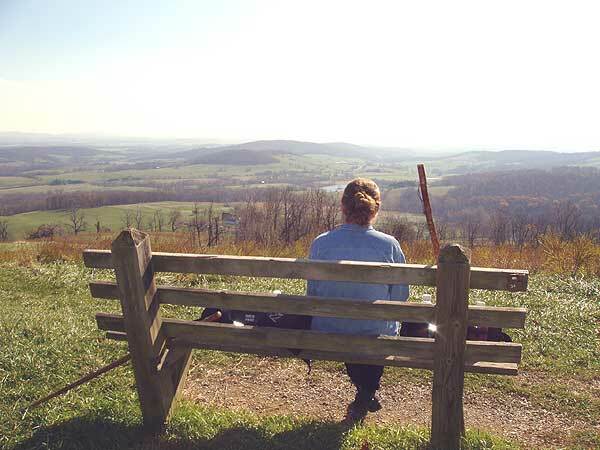 Once on the Ambassador Whitehouse and Piedmont Overlook Trails, the views return. 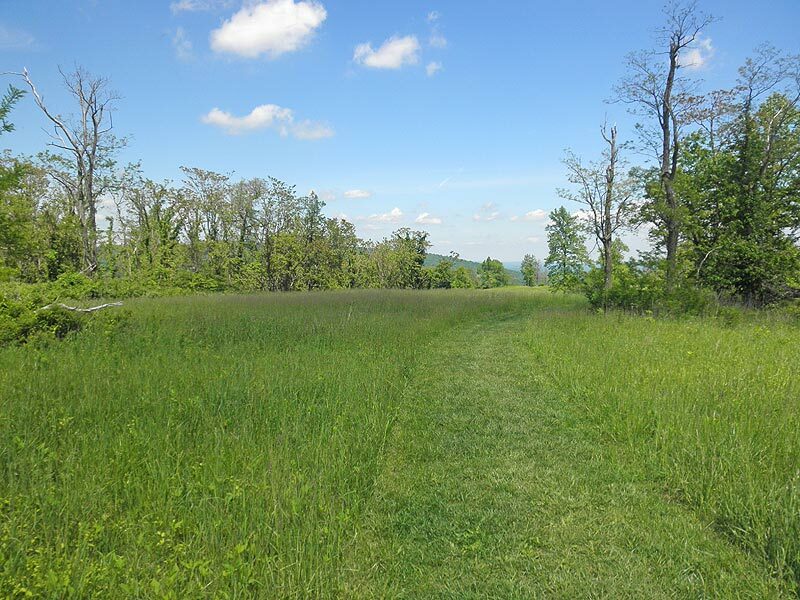 I have hiked Cold Mountain and as the hike summary states, these meadows are similar to the ones on Cold Mountain. 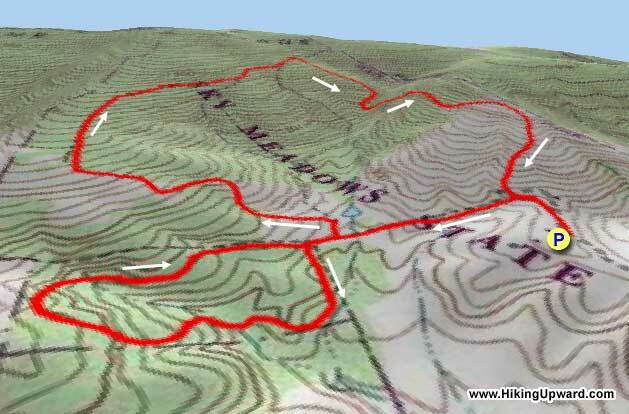 If you liked the meadows of this hike, I would recommend the Cold Mountain Hike to you. In summary, this was a good day hike. Although we made this hike a little shorter, I would agree with the difficulty rating of 2. Keeping in mind we were doing this hike on a 20 degree day in January, I would give it a solitude of 2 as we saw a large group finishing a guided hike at the beginning and 5 more people along the hike. There were many tracks in the snow and I could see how this hike could easily be a 1 or 0 for solitude during warmer, busier times of year. Camping is only allowed in the designated camping area/"campground". 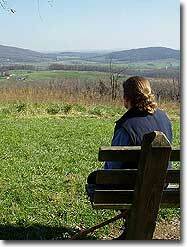 As I noted, there is only a short section of this hike where there are no views. The views were good along the majority this hike and I would agree with the rating of 6. A good hike to kick off the New Year! Great hike - easy, nice change of scenery from meadows to open hills, forest and streams - even a community of goats helping to clear some invasive plants! And lots of nice views. 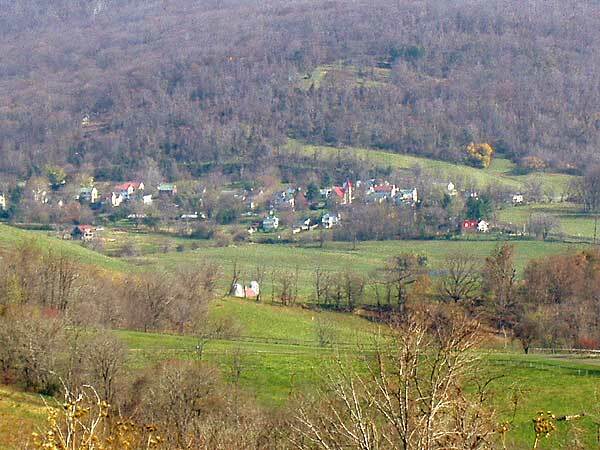 It is also not too far from DC. Go early, especially on the weekends, to avoid the bulk of the crowds. A really nice, simple hike that is easy. Bring a camera because there is a lot to see and experience. From the fields of wild flowers, to the large variety of birds, which include song birds and raptors, this 4th of July hike lived up to my expectations. We saw many Blue Birds. Toward the end, we came across a beautiful Gold Finch. Unfortunately, I didn't have my camera. :( She would have made a lovely photo subject. 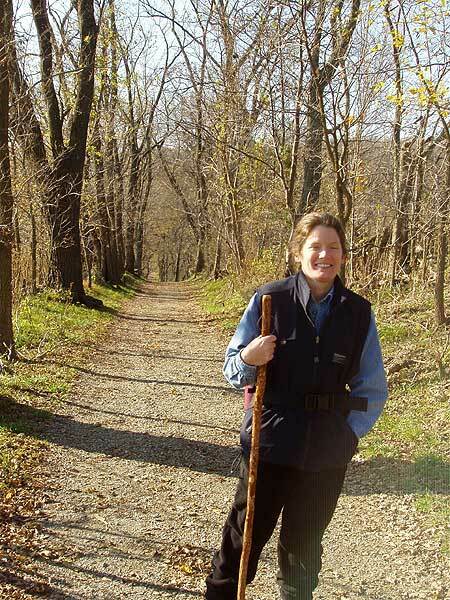 Wild, raspberries and blackberries were abundant all along the trail. Since these berries are not indigenous to this part of Virginia, my friend and I gorged ourselves on the yummy treats.